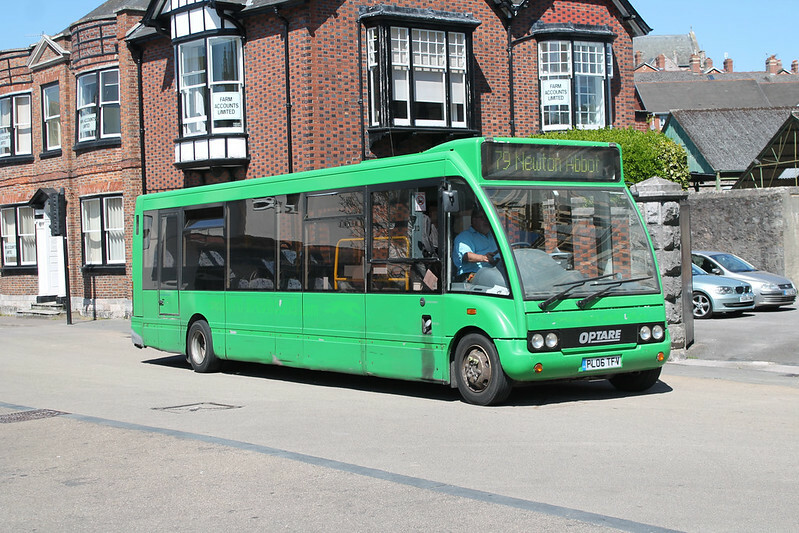 This introduces a new 15A which is an off peak Woolwell – Widewell – Glenholt link 3 round trips a day. PH0004983/35 - FIRST DEVON & CORNWALL LTD, THE RIDE, CHELSON MEADOW, PLYMOUTH, PL9 7JT Variation Accepted: Operating between TORPOINT FERRY and PLYMOUTH Bus Station given service number 81/81D effective from 24-May-2015. To amend Route and Timetable. PH1017984/75 ALANSWAY COACHES LTD T/A COUNTRY BUS, KING CHARLES BUSINESS PK, OLD NEWTON RD, HEATHFIELD NEWTON ABBOT TQ12 6UTOperating between Newton Abbot, Sherborne Road and Newton Abbot, Sherborne Road given service number 79 effective from 11May 2015. To amend Timetable. PH1017984/104 ALANSWAY COACHES LTD T/A COUNTRY BUS, KING CHARLES BUSINESS PK, OLD NEWTON RD, HEATHFIELD NEWTON ABBOT TQ12 6UT Operating between NEWTON ABBOT and REYNELL ROAD given service number 175 effective from 11May 2015. To amend Timetable. The 175 will also run five minutes earlier. PH1017984/16 ALANSWAY COACHES LTD T/A COUNTRY BUS, KING CHARLES BUSINESS PK, OLD NEWTON RD, HEATHFIELD NEWTON ABBOT TQ12 6UT Operating between Neton Abbot, Sherborne Road and Totnes, Royal Seven Stars given service number 177 effective from 11May 2015. To amend Timetable. The 177 is also slightly reduced (affecting Totnes departures) and will run five minutes earlier. PH0005305/35 - DEALTOP LTD T/A DARTLINE COACHES, UNIT 2, LANGDON BUSINESS PARK, OIL MILL LANE, CLYST ST. MARY, EXETER, EX5 1AF Variation Accepted: Operating between Crow Bridge and Crow Bridge given service number 350 effective from 20-Jun-2015. To amend Timetable. PH1066351/18 - FILERS TRAVEL LIMITED, SLADE LODGE, SLADE ROAD, ILFRACOMBE, EX34 8LB Registration Accepted by SN Starting Point: Ilfracombe Finish Point: Ilfracombe Via: The Shields Service Number: 34 Service Type: Normal Stopping Effective Date: 05-MAY-2015 Other Details: Monday to Friday except public holidays. PH1066351/16 - FILERS TRAVEL LIMITED, SLADE LODGE, SLADE ROAD, ILFRACOMBE, EX34 8LB Registration Accepted by SN Starting Point: Ilfracombe Finish Point: Ilfracombe Via: Fernway Service Number: 36 Service Type: Normal Stopping Effective Date: 05-MAY-2015 Other Details: Monday to Friday except public holidays. As is all to often the case, their own web site is useless. There is no mention of any of these new services at all, and the services they do detail do not have timetables – just a note telling you to try Traveline! PH1020951/208 - STAGECOACH DEVON LTD T/A Stagecoach South West, BELGRAVE ROAD, EXETER, EX1 2LB Variation Accepted by SN: Operating between St Marychurch and South Devon College given service number 22 effective from 13-Apr-2015. To amend Timetable. 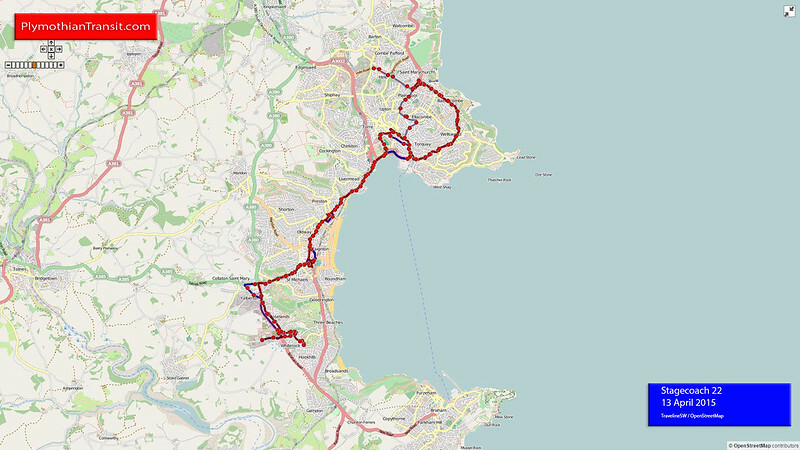 We are revising the times to our first 3 X46 journeys out of Torbay in order to improve reliability. Each bus will leave 10 minutes earlier than the current timetable. These changes will commence from Monday 20th April and new publicity will be available as soon as possible. These changes will also affect the first journeys on the 22, 23 and 34 bus services. PH1020951/160 - STAGECOACH DEVON LTD T/A Stagecoach South West, BELGRAVE ROAD, EXETER, EX1 2LB Variation Accepted by SN: Operating between Torquay and The Willows given service number 34 effective from 13-Apr-2015. To amend Timetable. PH1020951/42 - STAGECOACH DEVON LTD T/A Stagecoach South West, BELGRAVE ROAD, EXETER, EX1 2LB Variation Accepted by SN: Operating between Exeter Bus Station and Paignton Bus Station given service number X46 effective from 13-Apr-2015. To amend Timetable. These changes will commence from Monday 20th April and new publicity will be available as soon as possible. These changes will also affect the first journeys on the 22, 23 and 34 bus services. PH1020951/120 STAGECOACH DEVON LTD T/A Stagecoach South West, BELGRAVE ROAD EXETER EX1 2LB Operating between Barnstaple and Great Torrington given service number 75B/75/75A effective from 05May 2015. To amend Route and Timetable. From Sunday 3rd May a new timetable will operate on Route 75. 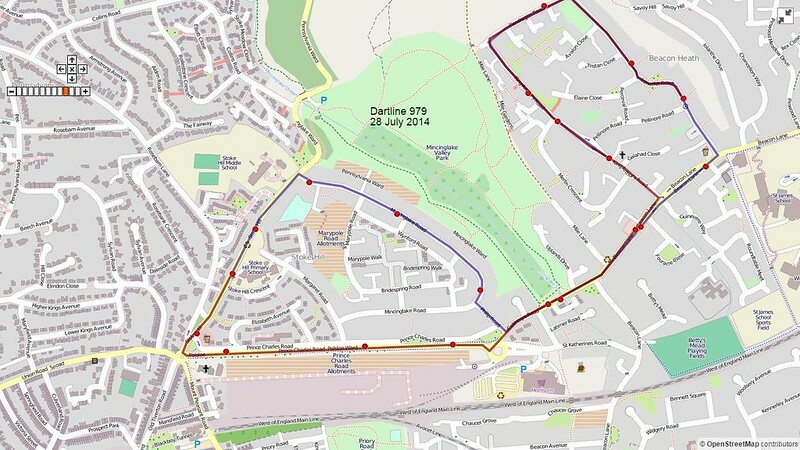 Route 75 will have a slight change of route, with certain journeys now operating from Dartington Fields via Hatchmoor Road, these are coded A in the timetable. PH0004727/9 - TAW AND TORRIDGE COACHES LTD, GRANGE LANE, MERTON, OKEHAMPTON, EX20 3ED Registration Accepted Starting Point: Barnstaple Bus Station Finish Point: Bampton War Memorial Via: Landkey, Swimbridge, South Molton Service Number: 307 Service Type: Normal Stopping Effective Date: 13-JUN-2015 Other Details: Saturdays only except public holidays. PH0004727/10 - TAW AND TORRIDGE COACHES LTD, GRANGE LANE, MERTON, OKEHAMPTON, EX20 3ED Registration Accepted Starting Point: South Molton, The Square Finish Point: Barnstaple Bus Station Via: North Molton, Brayford Service Number: 657 Service Type: Normal Stopping Effective Date: 13-JUN-2015 Other Details: Fridays only except public holidays. PH0004727/11 - TAW AND TORRIDGE COACHES LTD, GRANGE LANE, MERTON, OKEHAMPTON, EX20 3ED Registration Accepted Starting Point: West Buckland, Opposite Village Hall Finish Point: Barnstaple Bus Station Via: East Buckland, Cobbatron Service Number: 658 Service Type: Normal Stopping Effective Date: 13-JUN-2015 Other Details: Tuesdays and Fridays except public holidays. PH0004727/12 - TAW AND TORRIDGE COACHES LTD, GRANGE LANE, MERTON, OKEHAMPTON, EX20 3ED Registration Accepted Starting Point: East Ansty, Old Froude Arms Finish Point: South Molton, The Square Via: Oldways End, Bishops Nympton Service Number: 696 Service Type: Normal Stopping Effective Date: 13-JUN-2015 Other Details: Thursdays only except public holidays. PH0004727/8 - TAW AND TORRIDGE COACHES LTD, GRANGE LANE, MERTON, OKEHAMPTON, EX20 3ED Registration Accepted Starting Point: Brayford, Brayfordhill Shelter Finish Point: South Molton, The Square Via: West Buckland, East Buckland Service Number: 873 Service Type: Normal Stopping Effective Date: 13-JUN-2015 Other Details: Thursdays only. PH0000620/75 - ALBERT RALPH TURNER & PARTNERS T/A TURNERS TOURS, BOWLING GREEN, CHULMLEIGH, EX18 7BT Registration Accepted by SN Starting Point: Pannier Market, Honstone Street Finish Point: Bideford Morrisons Via: Service Number: 14 Service Type: Normal Stopping Effective Date: 05-MAY-2015 Other Details: Monday to Saturday. PH0000620/74 - ALBERT RALPH TURNER & PARTNERS T/A TURNERS TOURS, BOWLING GREEN, CHULMLEIGH, EX18 7BT Registration Accepted by SN Starting Point: Bideford Morrisons Finish Point: Honestone Street Via: Appledore Service Number: 16 Service Type: Normal Stopping Effective Date: 05-MAY- 2015 Other Details: Monday to Saturday. PH0000620/49 - ALBERT RALPH TURNER & PARTNERS T/A TURNERS TOURS, BOWLING GREEN, CHULMLEIGH, EX18 7BT Variation Accepted by SN: Operating between Chumleigh and Exeter, Royal Devon & Exeter Hospital given service number 369 effective from 05-May-2015. To amend Timetable. Note that VOSA have this from 5th May whereas Traveline have the new timetable starting 25th May. Turners themselves dont mention the service at all (yet). 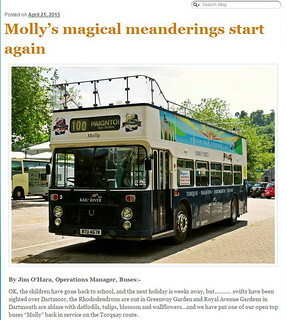 OK, the children have gone back to school, and the next holiday is weeks away, but……….. swifts have been sighted over Dartmoor, the Rhododendrons are out in Greenway Garden and Royal Avenue Gardens in Dartmouth are ablaze with daffodils, tulips, blossom and wallflowers…and we have put one of our open top buses “Molly” back in service on the Torquay route. STAGECOACH have confirmed that bus fares in the South West are to rise by an average of 1.8% from May 3. The changes mean that weekly unlimited local travel with Stagecoach in the South West, which has the lowest bus fares of any major operator in the UK, starts from just £1.16 a day. 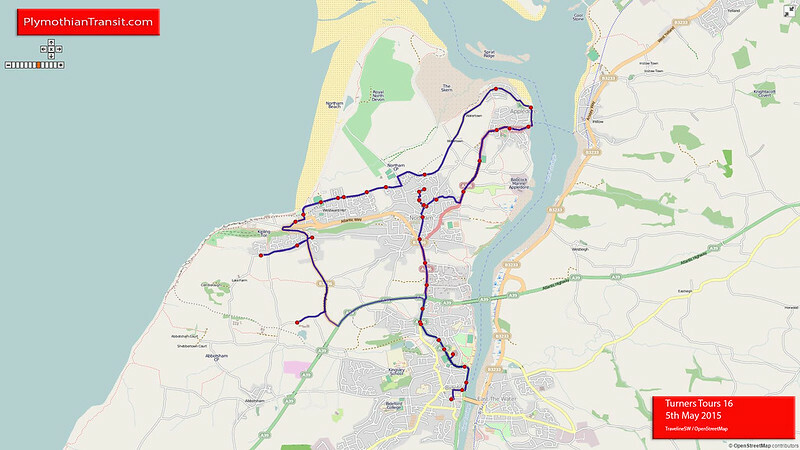 Stagecoach has once again frozen the price of many of its popular Exeter and Torbay day and season tickets, as well as introducing extended ticket boundaries to its Torbay zones, making its popular £1 child add on available at any time and introducing a Group Explorer day ticket. Firsts service changes seem pretty sensible. 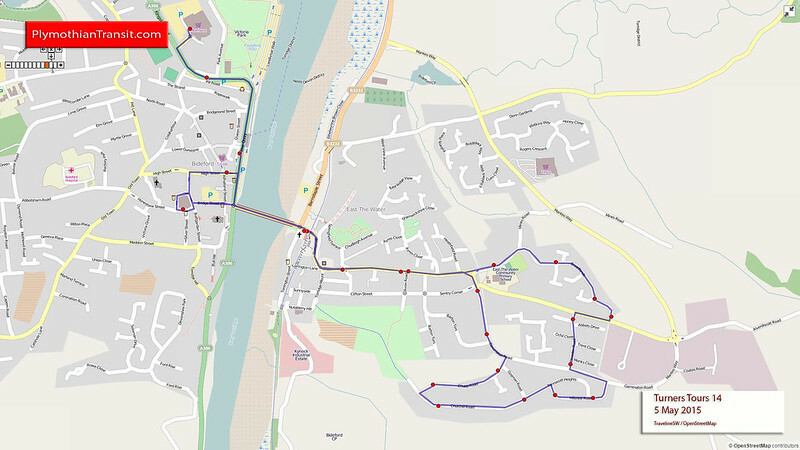 The 3a changing to just be a 3 looks like an opportunity for First to expand the 3a part of the operation from West Park, Honicknowle via Pennycross/Peverell to city to a 7 day a week operation, following on from the extension of the 6 to 7 days last December. 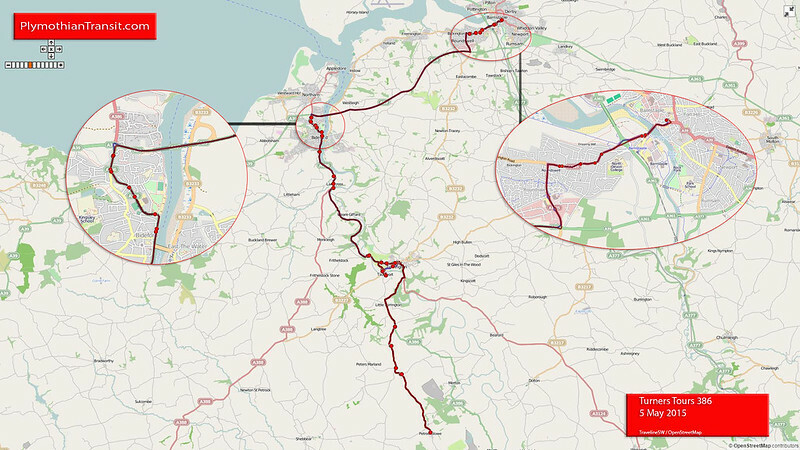 These routes must be doing ok then! I am sure the Sunday service will be welcome as it will be cheaper and more frequent than Citybus , as it is in the week too. Nice to see a service in Glenholt again (15a) and the extension of 81d to operate throughout the day seems to be a good sign for First too. 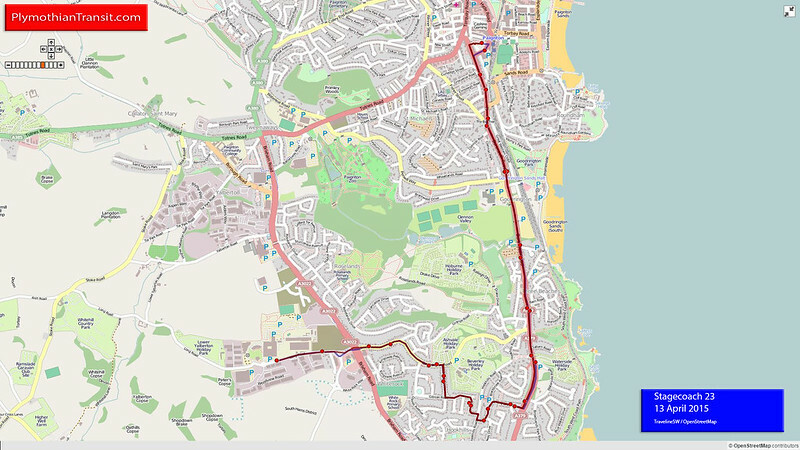 It appears the PR1a Derriford Hospital extension seems to be cut back to peak times only, which seems very sensible to me seeing as the new 81d will follow the same route from Derriford to Home Park anyhow before continuing on to Devonport.